However, there is one place in Washington that has a history of producing some spectacular gold nuggets over the years, and that is in the mining town of Liberty. 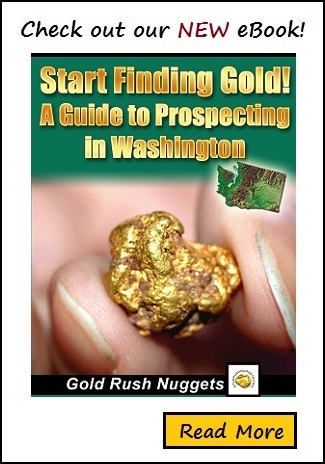 Located north of Ellensburg, the richest gold bearing areas around Liberty were found in Swauk and Williams Creeks. The earliest discoveries here were made back in 1873, and unlike most other areas that only produced fine gold dust and flakes, large nuggets were readily found in the Swauk district. Most of the placer deposits were exhausted long ago, but not all. In the fall of 2013, some miners were prospecting the bedrock of an ancient river channel in Liberty on Corbley’s Potato Patch claim. A prospector was swinging a metal detector over the bedrock and was having some success finding some smaller gold nuggets earlier in the day. Heavy equipment was used to remove much dirt and overburden, exposing the bedrock and allowing for the prospector to use his detector overtop the bedrock. They had been mining this area for many years, and certainly some nice gold nuggets had been found here before. Several multi-ounce nuggets had been found on his claim over the years, including one over 5-ounces a few years back. However, what they discovered was beyond anyone’s wildest imagination. The metal detector gave off a booming signal, indicating a large piece of iron rubbish. This is the sort of thing that is commonly found in mining country, and not unusual to find rusty junk with a metal detector. What was unusual is finding it in such deep ground that had just recently been exposed. What they expected to be iron soon turned into something much different. What the prospector had found was a 16.25 troy ounce gold nugget, smooth and rounded just like a golden potato! And if that wasn’t exciting enough, just a few feet away another 13-ouncer was unearthed! Both nuggets were smooth and iron stained, indicating that at one time they had been at the bottom or a river. Likely for millions of years, they tumbled around on the bedrock, producing their smooth and rounded shapes. At some point, the river channel changed positions, cut down, and somehow left an ancient river channel “high and dry.” These two spectacular nuggets remained there for millions of years, until their discovery. Any gold miner would truly consider these beauties the find of a lifetime! Are there still big gold nuggets out there waiting to be found?